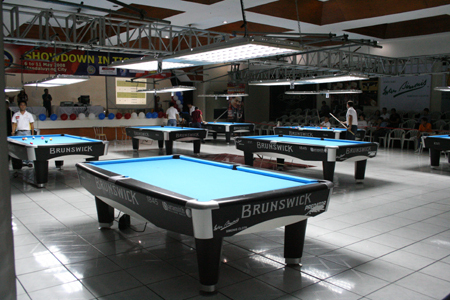 Stuff about Billiards in the Philippines. Heck, we are the top Pool playing country in the world! Antonio Gabica wins, Marlon Manalo, a Mandaluyong native, places second. $10,000 of the $30,000 prize money goes to Gabica after finishing the 10-ball match with a very convincing 13-8 score. Apart from Gabica and Manalo, other big names who participated in the tournament include Jeffrey de Luna, Leonardo Andam, Leonardo Didal, and of course the foreigners – Johnny Archer, Thorsten Hohmann and Satoshi Kawabata. The tournament was organized by Raya Sports and BSCP in cooperation with Mandaluyong Mayor Benhur Abalos. I proceeded directly to Mandaluyong after enjoying an early afternoon of knockout stages in Starmall, Alabang on May 8. Like I said in my previous post, the set-up of the Mandaluyong Mayor’s Cup is nothing compared to the Manny Villar Cup. Mandaluyong City Hall is a one-of-a-kind city hall. The place is well lit and ventilated (cool), and organizers seem well-prepared, with big-sreen (projector) scoreboards and audience etiquette banners. It is said that this tournament has been planned months ago and the other, just 2 weeks prior. Mandaluyong Mayor’s Cup however, got better nationwide coverage with Studio 23, compared to Manny Villar Cup’s Solar Sports. If not for Manny Villar Cup’s player-hoarding, this tournament would have been perfect. Warren Kiamco wins, Efren Reyes places second – with a finals score of 11-7. After that of course, they held the so-called “dream match” between Efren Reyes and Ronnie Alcano – a race to 4 exhibition match of rotation. Ronnie Alcano wins 4-1. Because of that, Efren lost twice in a row in one night, but, it’s good to see Efren back in top form. He played great during the knockout stages, impressing the crowd with magician-like prowess. I have some videos and pictures. The tournament was held at Starmall (a.k.a. Metropolis) in Alabang, in their “sports section” – old movie houses turned indoor basketball courts. The place was hot as there was no air conditioning, except for a bunch of industrial air circulators. The floor was covered with tarpaulin-like flooring which was loose. Scoreboards were basically useless, some were even facing away from the crowd. The tournament obviously lacked preparation; I went straight to the Mandaluyong Mayor’s Cup and felt like entering a 5-star hotel after checking out from a cheap bed & breakfast. There are two major tournaments being held simultaneously, because politics has blackened the world of Philippine Billiards. However, Manny Villar Cup wins in professional player-support, granted they sided with this tournament in their own free will; and Maureen Larazabal singing the anthem in the finals is definitely a plus. A short primer on Hadj cues. Hadj cues, is Hadjimar Baldeviso, a thirty-something cuemaker from Makati, Philippines. I first met Hadj about a year ago. My site, bilyar.NET was fairly new, the World Pool Championship was being held here for the first time, and my billiards addiction was stronger than ever. I’ve been wanting to retire my 10-year old Aragon cue, and figured the timing was perfect. Before I knew Hadj, I knew little about the Philippine cue-making scene. Little did I know that while I was waiting for my Hadj custom cue, I would have gone to almost every cuemaker within Metro Manila, try their cues, buy some of their cues, sell their cues. Yes, all of that happened while I was waiting for my Hadj cue to be completed. Don’t get me wrong, I’m not complaining. What I had wanted from Hadj was a simple Efren Reyes inspired cue – plain jane bird’s eye maple with a cocobolo handle. I supplied the bird’s eye. Five years ago I was so into cues that I directly imported the woods which were hard to come by locally. Hadj is very methodical in his craft. See, the difference with Hadj and other local cue brands is that Hadj is actually the one making the cues from start to finish, dealing with the customers, marketing, buying raw materials, etc. I believe this is how American cuemakers do it, other Filipino cue brands on the other hand are usually marketed by a “capitalist,” where sometimes we don’t even get to talk to whoever built the cue. I hate to ruin the cue-making reputation in the Philippines, but some of these capitalists don’t even play pool to begin with. I realized all of this after I had already given my order to Hadj, and boy was I glad. Hadj has been playing pool all his life. His venture into cuemaking is, to me, like his commitment to his pool passion. He knows every scientific detail there is to cuemaking, the ins and outs, he knows what kind of “hit” he wants his cues to have, and how he can relate to the customer’s needs with a little touch of the “Hadj hit.” When I’m in his shop, we talk pool and cues until the wee hours of the morning. A year of waiting did not bother me. Take note, a year is not the usual waiting time for Hadj cues, some unfortunate incidents happened while my cue was being made, and, my wood was being made “stable” in the process. I let him design the ringwork and he came up with a bloodwood-bacote-bloodwood all-natural style that compliments the cue very well. It comes with two shafts, one with a WB tip and one with Elk Master (my request). The ferrule is also only 1/2 of an inch, which I think also contributes to the hit. The hit. Ah, the heart of this review. For me, the cue did what I hoped it would do – retire my 10-year old playing cue. That is telling a lot. I’ve owned a lot of cues, I’ve always resorted back to my old cue. I always see something wrong with a new cue that I’m trying out. The weight, the balance, the hit, the shaft, the stiffness. I said this to Hadj when he asked for comments – “Bro, I haven’t found anything about the hit that I don’t like.” This is one solid hitting cue. Solid but natural. It feels like, well, wood. There’s a hit that is too stiff, usually one where a steel joint is involved, my cue is not like that. There is a hit that is too soft and whippy, my cue is definitely nothing like that. I’m not that technical in describing how a cue feels, all I can say is that this cue is definitely a keeper and a player. Congratulations anyway, compaÃ±ero. Well, we almost had another Filipino world champion in our hands, but the pressure of performing in front of a home crowd in Araneta Coliseum was a little too much for Roberto “Superman” Gomez. He took home second place, losing 17-15 to Daryl Peach of England. Gomez had everything going for him in the knockout stages, utilizing a “soft break,” ala Ronnie Alcano last year. In the finals, the tables were switched (literally), and the “soft break,” which is table dependent, was out of the equation. The match was close and tense from start to end. When the score turned 15 all, Roberto, realizing how close he was to attaining his dream, succumbed to pressure and missed a couple of balls. Daryl Peach strung two straight racks for the title. Gomez will be back for sure. He’s a forced to be reckoned with and he has definitely already made a name for himself in the billiards world map. He is still quite young also at only 29 years of age. Rumor has it that his VISA has been denied a couple of times which barres him from participating in U.S. tournaments. Good luck to Roberto in his future matches. Superman’s not dead. Here‘s the only decent picture I have of him. Just a remider. The Guinness 9-ball tour’s 2nd leg is already this weekend. Check out Star Sports for the coverage; it starts around 1 p.m. Philippine time. I have already blogged about this at bilyar.NETÂ with updates on tournament happenings. In the Philippine side of things, only Ronnie Alcano made it through the elimination rounds. He is now waiting for an opponent in the semifinals. Ronnie Alcano, the Philippines’ last and final hope for this tournament has been defeated by Fong-Pang Chao of Taiwan 11-6. Chang Jung-Ling of Taiwan defeated Lee Van Corteza 11-5 to win the opening leg of the Guiness 9-ball tour held at the Sultan Hotel in Jakarta, Indonesia. Corteza gets $6,000, Chang pockets $15,000. Lee Van scratched in the first rack and produced three dry breaks. In the 11th rack, while running-out, he was called for a foul due to his shirt touching a ball. Chang then cleared the table and led 7-4, then won 4 of the last 5 racks for the win. 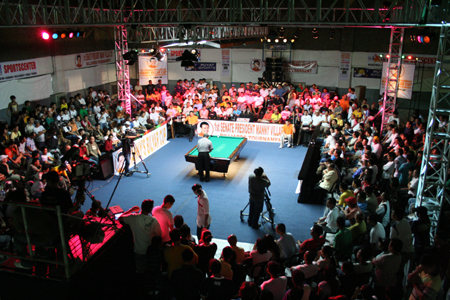 The Guiness 9-ball tourÂ is a ranking tour in Asia for players to qualify in the 2007 World Pool Championship; the top 10 players for the whole tour qualify. The total prize money for the Guiness tour amounts to $320,000. Winners of each leg will receive $15,000 and the Grand Final Champion gets $36,000. The next tour stop will be held at Kaohsiung, Chinese Taipei on May 18-20. Lee Van Corteza defeated 2006 World Pool Champion Ronnie AlcanoÂ 9-8 to advance to the semis. Dennis Orcollo defeated Fong-Pang Chao 9-5. Dennis andÂ Lee VanÂ will face each other in the semis, tomorrow April 22, which guarantees the Philippines a spot in the finals; and also gives Dennis the chance to avenge his heartbreaking loss against Lee Van in the recelntly held National Pool Championship. In the other side of the draw, 2005 World Pool Champion Wu Chia-Ching is still waiting for the winnerÂ of the Jimmy Jusman (Indonesia) vs. Chang Jung-Ling (Taipei) match. Rubilen “Bingkay” Amit, from Taguig, reached the finals of the 2007 Women’s World 9-Ball Championship (sponsored by Amway), recently held in Tao Yuan, Taipei. She took home 2nd place and pocketed $10,000; $20,000 went to the champion (Xiao-Ting Pan). What’s more impressive however, isÂ she defeated both Allison Fisher and reigning world champion Ga-Young Kim in the earlier rounds. Now this definitely proves that Rubilen is world class. AndÂ finally in the world billiards map, the Philippines is now well represented in both genders. Dennis Orcollo succumbs to Ching-Shun Yang 60-42. Congratulations to Ching-Shun. The turning point here, Yang’s break. Dennis couldn’tÂ seem to find his break ever sinceÂ day 2, although he led 20-19Â at the end ofÂ day 1. I can’t help butÂ marvelÂ on the non-Filipino this time. Yang’s knowledge of the gameÂ is really solid, plus he made shots from out-of-this-world with ease. To be held at the Trade Hall of Gateway Mall in Araneta Center, Cubao, Quezon City. Dennis “Robocop” Orcollo takes on Ching-Shun “The Son of Pool” Yang, to prove who the real Money Game King is. As we all know, Dennis is the current Money Game King here in the Philippines, and Ching-Shun holds the same credit in Chinese Taipei. The match,Â dubbed as “The Richest GameÂ in Asia,â€ is a race to 60 (9-ball) in a span of 3 days. Winner takes $10,000.00. The match starts 4 p.m. live, tickets priced @ Php 500.00,Â and telecast is delayed at 7 p.m. over Solar Sports. Kind of like Efren and Earl Strickland’s “The Color of Money,” only that was a race to 120. Pretty exciting and unique match I have to say; although determining the real Money Game King in an organized tournament does not really prove much in the world of Money Games. Also, they have not faced each other in any kind of game – quite surprising. Both are 28 yrs. old, and posses pure raw talent. I think Dennis has the mental advantage though, dubbed as “Robocop,” he is notorious for showing no mercy on his opponents. Ching-Shun’s game however is also solid. Funny though how in this match, Chin-Shun has the more “loose” stroke – somethingÂ Filipinos are known for.